Gelair™ Health-e Evap is specifically designed for use in evaporative coolers, as a means of disinfecting and sanitising the unit. The unique pod delivery system of Gelair™ Health-e Evap releases the natural benefits of Pure Tea Tree Oil providing microbiological, viral and fungal control and prevention measures in evaporative cooling systems. Evaporative units used for home, commercial and industrial air conditioning are a potential source of Legionnaires' disease. Additionally, an unhygienic system may lead to the growth of slime (biofilm) which can clog or foul system components (including the pads) which result in restricting the airflow and cooling capacity of the system. Any slime in your system is an indication it is cultivating harmful bacteria. Gelair™ Health-e Evap controls and prevents the growth of harmful organisms which are found in the damp and wet environments within evaporative cooling systems, including legionella. The Gelair™ Health-e Evap is an effective way of contributing to the cleaning of the system’s tanks, pumps and other components. It is as simple as placing the Health-e Evap pod in the sump or water tank of your evaporative system to allow the release of the Pure Tea Tree Oil and detergent solution. The mixture will disperse through the unit (including drain lines), controlling odours and sanitising the system. The product lifespan will depend on the environment in which your cooling system operates, although will generally last up to six weeks. The product may be exhausted at a quicker rate in systems with a higher or more frequent water exchange rate. 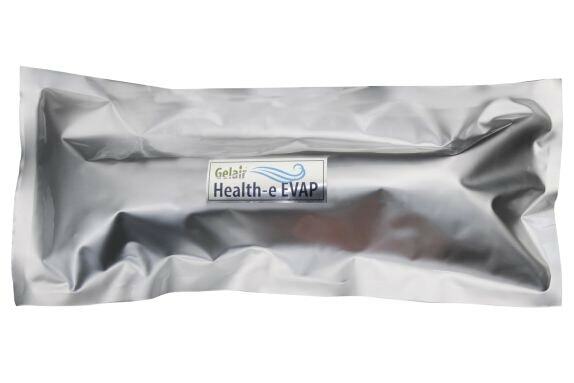 Gelair™ Health-e Evap is available in two pod sizes; small for systems with a tank capacity of 20 litres or less, and large for systems with a tank capacity greater than 20 litres. Gelair™ Health-e Evap offers a highly effective solution in controlling odours and sanitising your unit resulting in a longer lasting, more hygienic and healthier evaporative system.